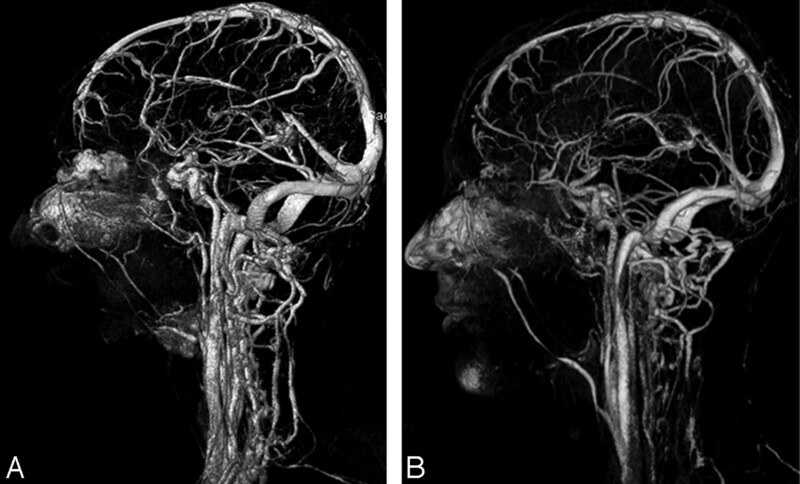 3D volume-rendered images from full-dose (15 mL) (A) and half-dose (7.5 mL) (B) contrast-enhanced MRV show diagnostic image quality of most of the cerebral venous structures. Half-dose CE-MRV. Sagittal (A) and axial (B) thin MIP images (TR/TE, 3.4/1.3 ms; flip angle, 25°) in a 28-year-old man with history of headache show filling defects within the superior sagittal sinus (A, large arrow) and transverse and sigmoid sinuses (B, small arrows) consistent with thrombosis. Note the high diagnostic quality of the vein of Galen (A, arrowhead), the basal vein of Rosenthal (A, small arrow), and the internal cerebral veins (A, thin large arrow). Half-dose CE-MRV. 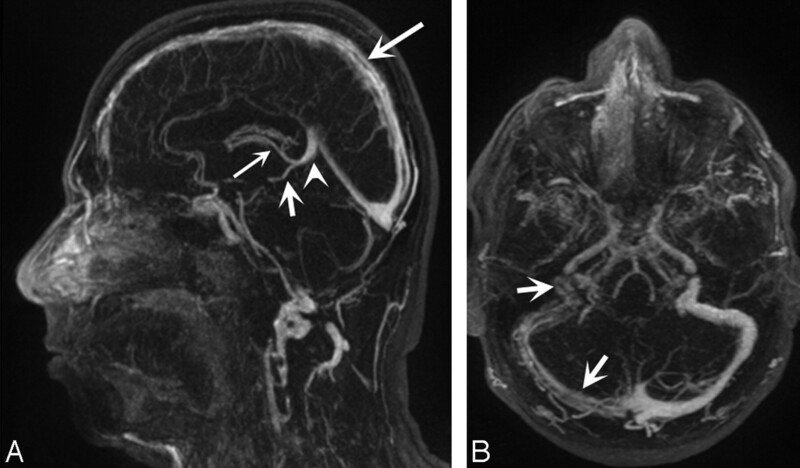 A and B, Coronal (A) and sagittal (B) full-thickness MIP images (TR/TE, 3.4/1.3 ms; flip angle, 25°) in a 27-year-old man show cerebral arteriovenous malformation nidus (A and B, arrow) and a large draining vein to the superior sagittal sinus (A and B, arrowhead). C–E, DSAs confirm the findings on CE-MRV. 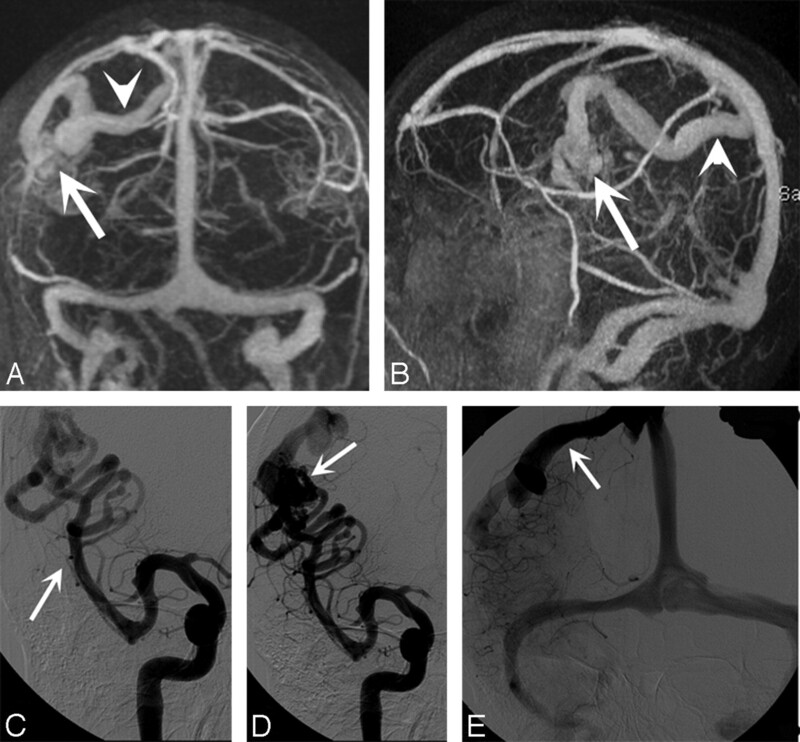 Feeder artery (middle cerebral artery) (C, arrow), arteriovenous malformation nidus (D, arrow), and draining vein to the superior sagittal sinus (E, arrow) are clearly visualized. Note:—CE-MRV indicates contrast-enhanced MR venography. * The 4-point scale for evaluation of visualization of venous segments is as follows: grade 1, not visible; grade 2, partially visible, not sufficient for diagnosis; grade 3, generally homogeneous enhancement and continuity of venous structure, sufficient for diagnosis; and grade 4, excellent image quality with highly homogeneous and continuous enhancement with sharpness of vessel border allowing highly confident diagnosis. There was no significant difference in the vessel delineation scores assigned by the 2 readers (P > .05 for all segments). Analysis with the κ coefficient revealed excellent interobserver agreement for the full-dose (κ = 0.87) and half-dose (κ = 0.85) groups. Delineation scores were significantly lower for the small venous segments, including the middle cerebral, septal, superior cerebellar, inferior vermian, posterior tonsillar, and thalamostriate veins in the half-dose group compared with the single-dose group (P < .01 for all). Note:—SNR indicates signal intensity-to-noise ratio; CNR, contrast-to-noise ratio. * All values are presented as mean ± SD. SNR and CNR values are significantly lower in the half-dose CE-MRV group compared with the single-dose CE-MRV group (P < .001 for all segments).